Finally, a completely painless laser treatment. Uncomfortable laser treatments are now no longer necessary. Our laser uses radio frequency and does not need to heat the skin. This means more comfort for you. Our treatments do not feel like you're being snapped by a rubber-band. Or worse: burned! And there is no need for messy gels. Make an appointment with us today so you can enjoy your laser treatments like you enjoy your facials. Within minutes, treat arms, face, underarms, and legs. Our technicians use and "Easy Glide" technology which allows us to offer a comfortable experience for the client and saftety for both the client and technician. 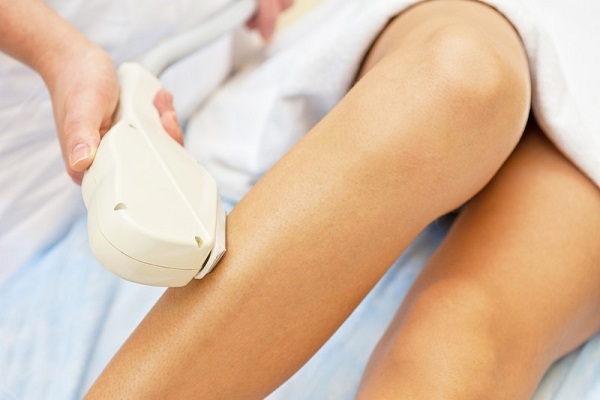 Due to the hair growth cycle, laser hair removal REQUIRES multiple treatments for the reduction of growth to be permanent. Consistency of treatments is important for optimum results. Laser should be performed once every week for 7 weeks. For best results, clients need to be consistent with their treatments so please plan accordingly. With this laser, it is recommended to do 7 treatments on each area of the body being treated (listed below) and then re-assess. Individual hair growth is unique to each person and results vary. Color and coarseness of hair influences results. Each package includes 7 treatments.